Bridal gowns should be a current style and in perfect condition. We are looking for gowns that are not more than 5 years old. You will receive 50% of the selling price when your gown sells and it is a 6 month consignment. We do recommend that you call to discuss your gown with staff before you bring it in. Prom gowns should be a current style and in perfect condition. We accept gowns January, February, March and April. 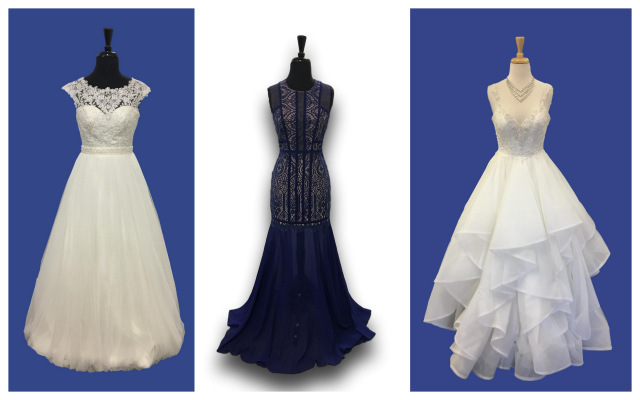 You will receive 50% of the selling price when your gown sells and it is a 6 month consignment. You may have your gowns back, at the end of the consignment period, if they do not sell. Evening gowns should be a current style and in perfect condition. They are accepted seasonally. Gowns are on a 6 month consignment. You will receive 50% of the selling price when your gown sells. You may have your gowns back, at the end of the consignment period, if they do not sell. The Gown consignment period is 6 months. Gowns will not be subject to automatic markdowns, but may be discounted during specific sales. Consignors receive 50% of the selling price. Prices are determined by The Stork & Fashion Exchange and are approximately 35-50% of the original sales price. There is a semi-annual consigning fee of $4.95 ( January – June and July – December ), which is deducted at time of consignment. There is a .90 item stocking fee, which is only deducted if the item sells. If you would like unsold items back, you may take them off the sales floor during the last 14 days of your consignment period. All unsold items, after the consignment period, become the property of The Stork & Fashion Exchange and may be donated, sold or discarded. Only in very rare cases may items be taken back before the full consignment period is up (except for the 14 day grace period preceding the end of the consignment period). Funds are available 3 days after an item has been sold & posted. Balances up to $50.00 will be paid by cash in the store. Balances over $50.00 will be paid by check. Checks are issued and mailed on Mondays by request. Automatic monthly checks are mailed by the 15th of each month, for those accounts with a minimum $50.00 balance. Account balances may also be used as store credit. Although all possible care will be taken of your merchandise, The Stork & Fashion Exchange is not responsible for theft or damage.